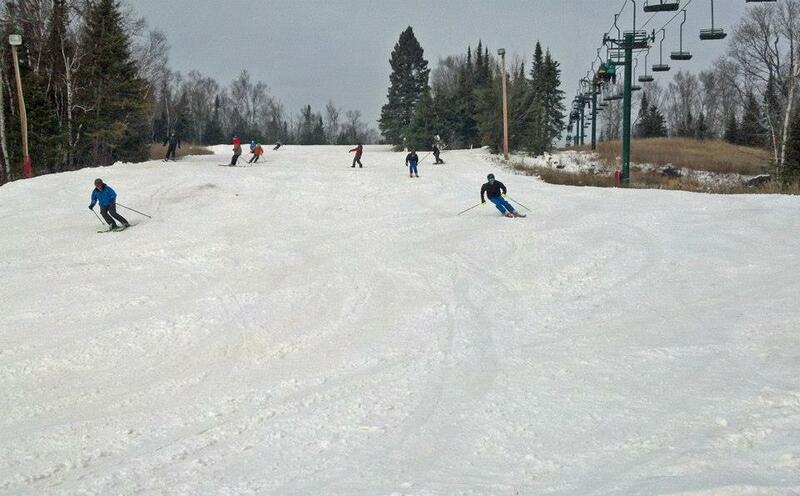 Lutsen is quadruple the size of most Great Lakes ski resorts. With four peaks, more than 1,000 acres, a nearly 900-foot vertical drop, 90 runs, and the region’s only gondola, it’s a legitimate ski area. This New England look-alike also gets rave reviews from skiers and snowboarers for scenery thanks to its spectacular views of Lake Superior from just about anywhere on the mountain. Located on four separate peaks of the Sawtooth Mountain range - Moose Mountain, Eagle Mountain, Ullr Mountain and Mystery Mountain - Lutsen offers long New England-like trails on 1000 acres of skiable terrain and a 1,088 feet of vertical. Rentals; ski and snowboard learning center offers lessons and programs including kids' programs. Wine tasting, a variety of restaurants including gourmet, and nightclubs are all nearby. Ninety-five percent snowmaking. The historic gondola base chalet has been completely remodeled with new restrooms and locker rooms on the lower level, new furniture, floor & wall coverings on the mid-level and a trio of fireplaces on the upper level to cozy up to after an invigorating day on the slopes. A new chalet at the summit of Moose Mountain is under construction, scheduled for opening in December. The 5000 square foot structure is adjacent to the top gondola terminal and more than triples the seating capacity of the existing Mountain Top Deli (plus offers a giant sundeck that seats an additional 225) and provides outstanding vistas over Lake Superior and the ski slopes on Moose Mountain. With more than 10 feet of snowfall last season, the off-piste tree skiing was sensational and prompted us to expand the glade skiing on Moose Mountain with three new tree runs for this season. Get Snow Reports, Powder Alerts & Powder Forecasts from Lutsen Mountains straight to your inbox!